Bobbi Kristina Houston Brown, daughter of Whitney Houston and Bobby Brown, has been the pride and joy of the entertainment industry since the day she was born. The phrase 'growing up in the limelight' is an understatement for a kid with superstar parents best known for their star power and struggles with substance abuse. On Saturday, the 21-year-old was found face down in a tub by her husband Nick Gordon. Now she clings to life in a Georgia hospital with her family gathered around hoping a medically-induced coma doctors have ordered will bring Bobbi Kristina back to full consciousness. This incident is scary not only because of the threat it poses to her health, but also because it comes just before the third anniversary of her mother Whitney's death on February 11, 2012, when she too was found in a bathtub, having accidentally drowned due to a drug overdose. Because of this, she's made international headlines more than ever before, unfortunately. But who is Bobbi Kristina, the person? Born on March 4, 1993, Krissy, as her family calls her, was introduced to many as an infant at the end of Bobby Brown's 1993 "Something In Common" video, featuring Whitney and produced by Teddy "Rumpshaker" Riley. One year later, Whitney told Ebony in a 1994 cover story—called "The Awards, The Gossip, The Glory: Whitney's Wild and Wonderful Year"—that she wanted to build her firstborn a "little house in the backyard and put her in it and say, 'This is where you're going to stay the rest of your life.'" The late icon wanted better for the daughter she kept by her side at recording sessions and on tour dates when the child wasn't with her strong-willed grandmother, Cissy Houston. Elsewhere in the Ebony feature, her parents fought to prove the media wrong about their love story's ups and public downs. "I know that they [the media] are trying to make my husband out to be this man who has no respect for his wife or his family, who has no respect for his marriage, who has no respect for too much of anything-but they're very wrong," she says … "They are plain on the fact that Bobby and I, no matter what people think or what the media will say, we're happy together. And we like being together … We love each other." Whitney also addressed physical altercation rumors surrounding the family at the time. "Me, a battered woman? Girl, please. No!" she responds. "Because [if that were the case] the next thing the media will say is, 'Whitney has left.' I wouldn't stay around to be beaten; that's not what I'm there for." Unfortunately, during a 2009 interview with Oprah Winfrey, Whitney confirmed that Bobby Brown was verbally abusive often, and physically abusive once. She explained that he'd spat in her face in front of Bobbi Kristina, and that it was her daughter who'd urged her to leave their relationship. "When we got back to the house," Houston said, "he spit on me. He spit on me. He actually spit on me. And my daughter was coming down the stairs and she saw it. That was pretty intense. I didn't grow up with that and I didn't understand why that occurred – [why] he had such a hate for me because I loved him so much." As she grew up, Bobbi Kristina accompanied her parents at various events, though she was largely kept out of the public eye. But in 2005, the Bravo reality series Being Bobby Brown pulled back the curtain on her family's life, often depicting Bobbi Kristina as a weary teen caught betwixt and between two wild and intoxicated adults. In April 2007, her parents divorced and Whitney was given custody of Bobbi Kristina, then 14 years old (via People). 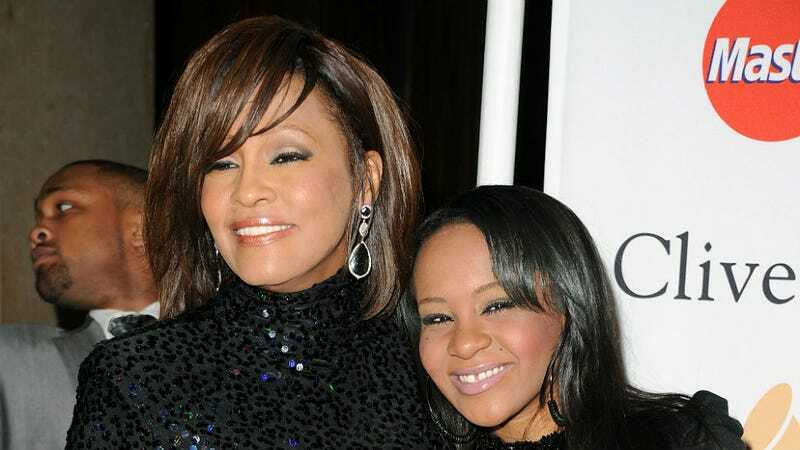 It's clear that the mother and daughter loved one another—though a 2008 National Enquirer story alleged that Bobbi Kristina attempted to stab her mother with a knife before trying to cut herself and was admitted to a Georgia psychiatric ward. "Krissi is addicted to cocaine. I've tried to stop her, but all she said was, 'I'm just like my mother!'" a former very dear person to me did this. Set me up to make it look exactly what it looks like. God will smite them yes..But it's really not what it looks like.. People will do anything for money which is extremely sad, and I'm very hurt by this." I love my family so much. My mom just comforted me to the max, and I'm so thankful for her. Thank you so much lord for blessing me with an Phenomenal family and incredibly phenomenal mother. Thank you for giving me the strength to move forward and put things in the past. Necole Bitchie also mentioned that the she was banned from Myspace four years earlier when images surfaced showing her smoking and drinking from a red solo cup. In February 2012, Whitney Houston died, shocking the world and Bobbi Kristina, who was subsequently rushed to the hospital twice, according to TMZ. Stories also surfaced about her heavy drug use after her mother's funeral, where her father Bobby was seated so far away from his daughter that he ultimately left the ceremony. By spring, Tyler Perry cast Bobbi Kristina in a TBS show called For Better or Worse for one season as an actress. During rehearsals, rumors abounded that she was high and difficult to work with, but Perry jumped to her defense, like he'd done for other grieving stars like Janet Jackson around the death of her brother Michael Jackson. The director and producer told the media to leave "this baby alone." Bobbi Kristina's TBS acting debut went well and she said she'd like to play any representations of her mother on screen. In July 2012, Krissy announced her engagement to Nick Gordon, who'd lived with the Houstons since he was 12, and whom she'd described as like a brother. Houston took Gordon in when his mother could no longer care for him. Furious about the couple's relationship, her grandmother Cissy publicly decried their union. That fall, the ill-fated Pat Houston-produced reality show The Houstons: On Our Own aired on Lifetime to Cissy's dismay. Many viewers felt uncomfortable watching because they considered it too soon after Whitney's passing to profile the family. Bobbi Kristina, like her parents before her on Being Bobby Brown, seemed intoxicated in many scenes. On January 10, 2013, Bobbi Kristina married Gordon, which she announced on Twitter. (A recent statement from her father disputes that fact.) Cissy, still upset, called the marriage "incestuous,"and the divide between the grandmother and granddaughter widened. After releasing her book Remembering Whitney, of which Bobbi Kris didn't approve, Cissy told Oprah Winfrey during an interview that her granddaughter might be headed down the same road as her mother because she's "hard-headed." The two didn't speak at the time of the conversation. "I am my mothers child ! Have you ever heard of a #fastmetabolism ? Damn, lol it's incredible how the world will judge you 4ANY&EVERYthing." Meanwhile, her husband Gordon got into a fight with Bobbi Kris's uncle Gary Houston, and his wife Pat obtained a restraining order against Gordon—because Gordon threatened Gary and posted photos of guns online. Soon after, images of a woman who looked like Bobbi Kris smoking from a bong surfaced on Instagram, but Bobbi denied any wrongdoing. "I've never posted any photo of me doing anything! This is someone trying to tarnish and make a horrible name for MYSELf. People are insane." By the summer of 2014, Angela Bassett was given the green light to direct a Lifetime biopic about her Waiting to Exhale co-star, but didn't cast Bobbi Kristina because "she's not an actress" (via E!). In response, Bobbi Kristina called Angela everything but a child of God on Twitter, before deleting her tear. In the last few months, Bobbi Kristina appears to have been enjoying married life and working on new art. Bobbi Kristina is fighting for her life and is surrounded by immediate family. As her father already stated, we are asking you to honor our request for privacy during this difficult time. Thank you for your prayers, well wishes, and we greatly appreciate your continued support.